How wonderful it is to read a really atmospheric spy thriller? Exposure is clearly the work of a highly skilled and experienced writer, but then we knew that about Helen Dunmore didn't we? Set in 1960 at the height of tensions between Russia and the UK, Simon Callington comes into possession of a top secret file. Not knowing what to do, the file is soon hidden in the hopes that by doing so, it won't be able to harm the lives of he and his wife Lily and their three children. Soon after he is taken into custody accused of feeding information to the Soviets. Lily understands that Simon has become the victim of a game those more senior to him have instigated, yet little does she know the difficult truth about Simon's past and his involvement with his friend Giles during his years at Cambridge. The past lives of the characters play and important role in moving the story forward. 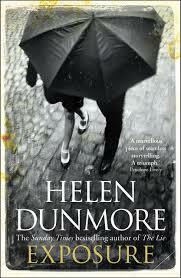 Dunmore effortlessly builds a picture of her central characters, whether it's Simon and his difficulty connecting to those around him, Lily the migrant from Germany suddenly made to feel like an outsider again, or Giles the once great man humbled and alone in hospital, regretting the passage of perhaps the one sincere relationship he ever had. These are complex and interesting people to read about and while the plot itself is far from fast paced, there is an atmosphere of quiet sustained tension bubbling throughout the novel. As we've come to expect from Dunmore, the book is beautifully written and evocative, and keeps the reader on edge right up until the end. Thank you to the publishers for providing a free copy to read via Netgalley.